Wigan Athletic fans have their say on another eventful week. Because I’m mostly positive when I write these pieces, I’m going to start with the pinnacle of our week. Plain and simple, what a win against West Brom on Saturday. They are one of the best teams in the division and Paul Cook and his players got it spot on. I’ve said it time and time again and I’ll stick by it, we can give any team in this division a competitive game at the DW Stadium. It’s a shame the same can’t be said when we play away from home. The Millwall result on Tuesday night now means our away form is a serious concern. You can point at missed penalties (Josh Windass blazing over the bar), you can point at missed one-on-ones (James Vaughan going through on goal and taking a heavy touch) and you can point at lack of ambition on the road (waiting until we’re losing with barely 10 minutes remaining to call on Callum McManaman). The bottom line is we’re sloppy in someone else’s backyard. We give the ball away cheaply, we don’t communicate and we simply don’t reach the concentration levels and cohesion we have at home. We’ve started well, but it’s a very long season. If we don’t sort out the results on the road we’ll be dragged into a relegation battle that we have the quality to avoid. The attacking football at the DW is wonderful regardless of the result – it mostly leads to points on the board these days. When you’re entertaining your own fans you need to be aggressors. However, I feel we need to get back to basics away from home. Start doing the simple things, win your individual battles, look after the ball, prioritise the clean sheet etc. It’s not pretty, but I can’t help feeling that a 0-0 away draw sooner rather than later will do us the world of good. I must reiterate that I have every faith in Cook. It’s easy to forget it’s his first taste of managing at this level and he’s well aware of just how ruthless the Championship is. What a few days! And what have we learned since kicking off on Saturday? 1. Wigan are capable of some fantastic performances and beating the very best this league has to offer. 3. Things are never dull at this great club! It’s been an interesting week, but that’s nothing new at this club we love. From a wonderful goal from newboy Windass to that stunning five-minute turnaround at the Den, there seems to be little danger of our club falling into the dire 15-year long spell at Ipswich. West Brom was amazing, Milwall was gut-wrenching, but you know what, that is the Championship. A great start this year makes it easy to forget that we are a newly promoted team. And however much time we spent in the PL, we don’t have the budget that many of the big boys in this league have. Yet we are more than competing. A bit of luck, we could be in the playoff places. Even without it, we are having a very good season. A lot lot better than our last two at this level. So let’s enjoy it. I know Wiganers love a moan but let’s enjoy it. It’s a roller coaster season and it will only carry on this way. But if we start getting on the team’s back even after such a strong start, simply because we are taking longer to adapt on our travels at this higher level, we risk losing the fantastic edge that we have at home. We are bound to go behind at some point this season at the DW, and that can’t trigger the doom and gloom in the stands if we are to maintain the fortress. Stick with the team and it can continue to drive us forward, and not only that, once we get to grips away from home then things will really get interesting. Look forward to a great following at an in form Sheff Utd! Up the Tics. From the fantastic to the not so fantastic in the space of three days. If Wigan Athletic’s season could be summed up in one week this would be it. First the fantastic, Latics were quite simply awesome against West Brom. 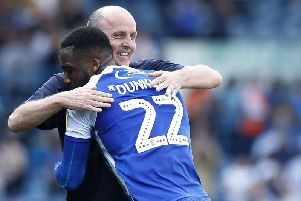 The performance from start to finish was exactly what was needed after the Preston debacle and showed just how good this Wigan Athletic side can be. An un-orthodox starting line-up including the first league start for Gary Roberts was questioned before kick-off and in some quarters criticised but every man on the pitch put in one hell of a shift to overcome the promotion favourites. The aforementioned Roberts was absolutely awesome. For someone who had yet to feature this season, to come in and perform how he did was fantastic. He embodied everything good about Saturday - he would have run through brick walls if asked to. Gary Roberts has a habit of forcing people to eat their words, he did it against Fleetwood last season where he put in a man of the match performance and did the same here. He may not be able to do it every week at this stage of his career, but he’s still a valuable member of the squad and I was delighted he again put in a man of the match performance on Saturday. It wasn’t just Gary Roberts who put a shift in on Saturday. Dan Burn, making his first full appearance from his injury lay-off, appeared in an unconventional left back slot but looked like he had played there all his career. Nathan Byrne slotted in as an attacking midfielder and was a constant threat. Saturday really looked like we were making progress but as with most of the season it’s a different matter away from home. Latics hasn’t been a happy trip in the Championship. This theme continued against relegation threatened Millwall on Tuesday. Paul Cook once again made a number of changes to his starting line-up, four in total. Once again there was no place for Callum McManaman. Latics surprisingly took the lead on the stroke of half-time. The first half was probably one of the worst performances of the season and despite that it looked like Latics away fortunes were finally about to turn. As the second half got underway Latics fans couldn’t believe their luck as they earned a penalty and a chance to put themselves further ahead. Sadly Josh Windass’ penalty is probably still on it’s way into the atmosphere. As soon as that penalty was missed you knew the script, and sadly Latics fell for it hook, line and sinker. Millwall earned a penalty themselves and drew level. At this stage in the game and with how poor Latics had been you would have taken a point. Sadly a further defensive lapse led to Millwall taking the lead and a Wigan side returning from the capital empty handed. There is clearly something going wrong on the road for the Latics at the moment. What it is I’m not sure. Our approach away from home, certainly since the Aston Villa and Stoke matches seems to have changed to a more conservative approach. Some of that has been enforced by injuries and suspensions of course. There’s no better way to respond than with another match Saturday and with a trip to joint leaders Sheffield United. As daunting as that may seem Latics seem to perform better against the sides higher up the table. Let’s hope that’s the case again Saturday and Latics can get over this away day blip. That’s how it feels, at the moment, being a Latics fan. A drubbing at Preston, probably the best display of the season against West Brom, and then missing a penalty and chucking away a lead at Millwall. If Latics did rollercoasters, this season would be the one which is closed at half the time while they mop up all the sick. Incredibly, if our away form this season came even halfway to what it was last season, we’d actually be top of the table. Only three teams have taken fewer away points than us this year, and our six away defeats is the most in the Championship. But I’m not disheartened. Why not? Well, we’re 10th in the table and we’re approaching a third of the way through the season. Anybody, back in August, who thought we’d be just one point out of the playoffs by this stage would have been considered delusional. Holloway in charge. These are probably the same people who think we won the FA Cup in spite of Roberto Martinez, and not because of him. True fact: Being a Latics fan has always been an adventure. If you don’t like it, don’t watch, it’s as simple as that. On the upside, seeing Nathan Byrne back in action at the weekend was a welcome sight, but you do have to wonder why Callum McManaman can’t get a game. Whatever Paul Cook isn’t seeing in training must be serious. It does make you wonder whether McManaman was only signed to make sure we had the required “club-developed player” needed for each matchday squad. If that’s the case, it’s a shame. McManaman was (and maybe still is, who knows?) a great player on his day, just ask Gael Clichy. But, whatever happens, I still see no reason not to trust Paul Cook. A runaway League One campaign, 10th in the Championship, and an FA Cup experience to match almost any. Let’s stop the moaning, and get behind a manager who, it feels like, is truly one of us. But then we wouldn’t be Latics, would we. They say that a week is a long time in politics. Well two weeks is a very very long time in football, and not just because of the boredom with no Latics game due to the international break. It also seemed like a very long time because there couldn’t have been more of a difference between the sludge of Deepdale, and the weapons grade free flowing rocket fuel from last Saturday. OK, it wasn’t 90 minutes of end to end rip roaring stuff, but in terms of professionalism, character, desire and ability West Brom was a world away. It was as far away from preston as you can get, which is where most of us like to be. I have always said that results this season might be a bit up and down at times, but I did not expect the levels of performance to be so marked as well. Josh Windass personified that. He may well never put in a performance as bad as the one before the international beak, but last weekend he played excellently. Then again so did everyone. It really did appear that the whole squad wanted to make amends for the previous game. And that is a great sign. It is also just as well because there is another game to make up for now. The performance level at Millwall on Tuesday was well below par again. This was one of those games where I could feel very smug simply for attending. Though I didn’t feel very smug after the game. It was a very strange game. The team selection seemed odd, though we had learnt to give the benefit of the doubt to the gaffer after Saturday. If Latics seemed intent on their own downfall in the first half, they found Millwall seemingly unwilling or unable to take advantage. And so after the break, with Latics having a nearly accidental lead, the lads really got down to business and positively forced the home side to take all three points. Refusing to score a second goal, gifting them a penalty and then allowing them to play all around and through their defence so that they could tap the ball into the half empty goal. The whole game was about ‘touch’. The decisive one from the defender that gave Latics the lead. The terrible initial one of James Vaughan which prevented a chance on goal when clean though. The seemingly non-existent one that sent Vaughan to the floor to win the penalty. The far too powerful one which sent the aforementioned penalty wildly over the bar. The clumsy one from Reece James which gave them a penalty. And the fear of getting one on a Millwall player in the area, which meant we didn’t get close to getting one on the ball, which in turn allowed them to score the winner. A night, which started badly when I ordered a pie in a pub and was actually served up a casserole with a puff pastry lid, descended into some sort of strange tasteless hash. However there is always an upside. Just a shame that on the occasion, the only one I could find was that in leaving a few minutes early, I managed to catch the early train home. This feels a little awkward to be honest, questioning the team after the midweek loss at Millwall, but considering it was the sixth defeat from seven away days, seven from eight if you count the EFL Cup defeat at Rotherham, there is a definite trend to be considered. Our performances and results at the DW Stadium are electric, unbeaten and 17 points gained from a possible 21 is promotion form, so where does the problem lie? At home we play a high energy, high pressing game that keeps us on the front foot, on Saturday against West Brom we never allowed them to settle in possession at the back and harried and harassed what is undoubtedly a very talented team so much so that, barring the opening 20 minutes, they never had a look in. It was a typical Paul Cook side performance. Move on to Tuesday and the energy, drive and fire had vanished, lumping aimless long balls up field, not closing down space or players and allowing what can only be described as a very poor team in Millwall to somehow muster over 20 attempts at goal, certainly leaves you scratching the old head as to what brings on such a transformation in our play away from home. If at the start of the season I’d have been told that following 14 games we’d be 12th on 20 points I would have been delighted, and I am, absolutely delighted, but we need to sort out our away day blues as a priority. We have certainly missed the pace and directness of Gavin Massey. Will Grigg and Michael Jacobs are also big losses at this time but Cook needs to find a solution to this and keep us in the top half of the table as we approach winter. I have every confidence that we will break the away day hoodoo, it is just a little frustrating and disappointing at the moment.